Alfie Kohn is an author who I have mentioned many times. He wrote several thought-provoking and well-reasoned books such as No Contest and Punished by Rewards (both of which I warmly recommend). 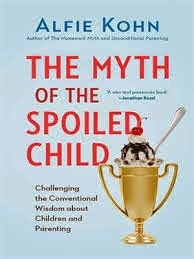 In his new book The Myth of the Spoiled Child, Kohn attacks some popular ideas about children and parenting, such as that parents are too permissive nowadays, and that many parents are overprotective and overly intrusive into the lives of their children (which is called overparenting). Also, he critiques popular beliefs such as that it is necessary to reward children, that success equals winning, that emphasizing grades works well, that there is much grade-inflation, that children should be confronted with unpleasant experiences so that they can get used to it for their later life, that children have too much self-esteem, and that they must be taught more self-discipline and grit (read the exerpt The downside of grit in which Kohn criticizes the work by Angela Duckworth and a book by Paul Tough). Kohn argues that for these beliefs and practices there is little evidence or shaky evidence at best and that, in fact, for many of them there is convincing counter-evidence. Looking beneath a child's behavior in order to understand the motives and reasons that underlie it. I think this book will make most readers think deeply about how they work with children.